A Mercedes SUV picked me up in Las Vegas for an hour-long to the desert. A company rep apologized for the long ride, but said they couldn’t find a curvy road closer to the city. Most Nevada roads are straight and flat, something I noticed much more after they pointed it out, and the Germans needed some curves to show what Drive Pilot can do. The car does 80 percent of the driving. Drive Pilot is to the steering wheel what adaptive cruise is to stop and go pedals. 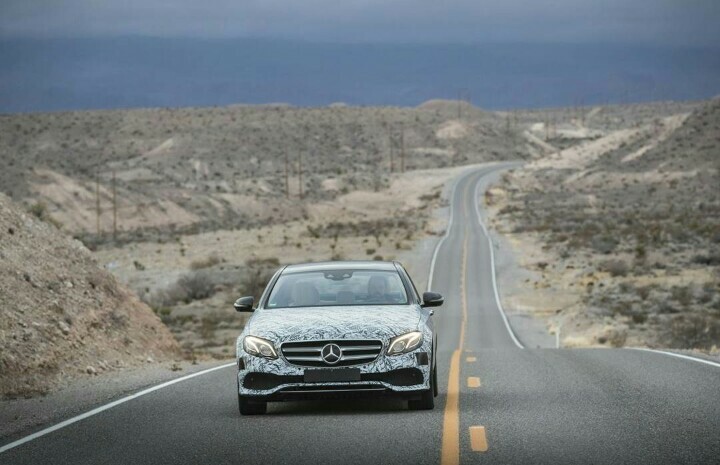 Like Tesla’s Autopilot, the Mercedes system allows the driver to hand over direct control of steering and speed, while still supervising the overall operation of the car. Think of the driver as a manager in charge of employees: they’re controlling overall direction, but not micromanaging each individual operation. A simpler version of Drive Pilot is available today in the 2017 Mercedes E-Class, and Daimler AG board member Ola Källenius told me that the new Drive Pilot can take charge of 80 percent of driving tasks, while the more primitive E-Class version can only handle a paltry 20 percent of the job. It’s activated by pressing a button on the steering wheel and the car will maintain speed and keep within its lane. Though the driver doesn’t need to keep a hand on the wheel, it will request a driver response every 10 seconds or so, depending on current road conditions. A pair of capacitive-touch buttons on the steering wheel can be used to acknowledge the request, which starts with a visual notification and escalates to an insistent bonging if ignored.